Another Unique Night at the Rush Bar Open Mic in Paris – Yes, Again! PARIS – I seem to be writing a large percentage of this blog in recent weeks about the Rush Bar open mic. My apologies to anyone who finds that boring – but the reason is that the nights at the Rush bar, as last night again proved, are anything but boring. In only my third ever visit to this relatively new open mic – last night’s Rush open mic was edition No. 22 – I again had a fabulous evening of playing, listening and socializing. There is, for me, at the moment, no open mic in Paris that equals this ambience. I was really pleased to be able to almost close out the evening last night, as the ambience was at its height. Having said that, arriving at 21:30 was really the absolute limit, and even, in fact, beyond the limit to get a spot on the increasingly expanding list. But again, the evening was expertly, and warmly MCd by Charlie Seymour, a longtime Paris expat musician…. PARIS – No sooner did I return from Oxford on Monday – Oxford, England, by the way – than I decided to attend very quickly the open mic on Tuesday night at the Feline bar, since I can never get to the Café Oz early enough for a good spot, so popular has that open mic become. 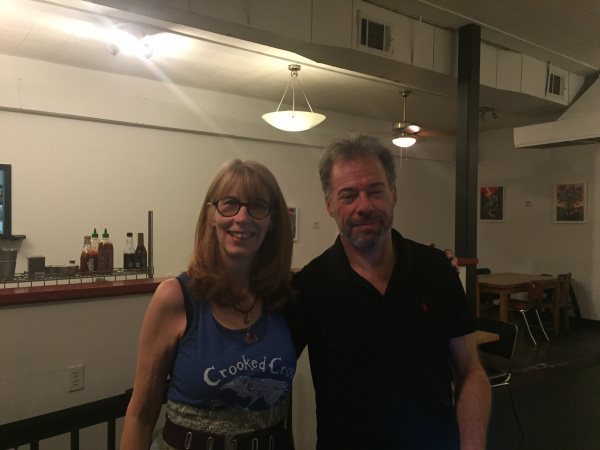 So I went to the Feline, played my songs, and THEN wen to the Café Oz, because I knew there would be some friends performing from Texas…. And no sooner did I arrive at the Café Oz than I found the place bubbling with energy and activity, and guess what? It was precisely the moment that Christy Moore from Austin, Texas, and her friends began their invasion of the “stage” at the Café Oz. So we spoke when we could, sat around and listened to the talent, and then called it a fairly early night. I was still recuperating from the Oxford trip, in any case, and preparing for the next…. But it was a great pleasure to see Christy Moore – who used to run an open mic in Austin called “Tom’s Tabooley,” and her friends, four women from Texas, lighting up the stage in Paris near the Moulin Rouge. I always feel sort of surreal when I see people from one country where I play, playing in another country – as I do myself all the time, but somehow don’t expect of others…. P.S., I hope I did not provide any confusion to anyone with my headline for this post, as in the past I wrote about a French friend who used to call himself “Texas in Paris,” and did some pretty crazy songs. He’s now Baptiste W. Hamon, and still does some crazy songs, although not quite as crazy, oh, and now in French! But last night all the pieces fell in place on my triple header of the Tennessee Bar, Galway pub and Coolin pub open mics. And if it was the same three places, there were many new musicians, and I myself decided to try out some new songs. It is often difficult to try new songs because as a performer, I always want to please my audience, and when certain songs “work,” it is always easier to stick with them. But last night I decided to play one I rarely do – my song “Sing It” – and I also played for the first time in these places this old Irish song by Christy Moore, that I have sung since I was around 16. I had completely forgotten last week that I knew by heart all but two verses of the song. So I memorized those, and got the better of my usual aged, fading memory, and tried to inject new life into this song. I had always thought the song, “I Wish I Was in England” – I THINK that’s the title – was a traditional Irish song. But it was written by Christy Moore in the late 70s or early 60s. Anyway, the OTHER acts were great. I liked the violin and guitar duo at the Coolin – and also saw them at the Tennessee before they played and before I cut out. I liked the young duet at the Galway, but as I had to play right after them, I went upstairs to tune my guitar and missed most of their songs. I liked the soul singer at the Tennessee. I managed by a great bit of luck to play at each place thanks to: Arriving too late at the Coolin and signing only 14th on the list; arriving early enough at the Tennessee that there was practically no one there; arriving earlier than ever at the Galway after the Tennessee and before returning to the Coolin, and so the list was short enough that I got on almost immediately there too. I did a total of nine songs for the night. Another good open mic crawl in Paris…. It was a wonderful return to two Paris open mics last night for several reasons, not the least of which personally was the absence from behind the mic for four nights for me…. But I have a little news and a little observation to make. Oh, and I was clearly not the only one to be happy to get to the open mics again: There were lots of people at both the Tennessee Bar and the Galway Pub. The bit of news I learned last night at the Galway was that Romain Bretoneiche, who performs under the name of his band All the Roads, will be taking over the MC job at the Galway Pub open mic every Monday. Stephen “Danger” Prescott, who has been doing it for three years is leaving the country. It is a sad moment in that regard, but great that Romain is taking over, too, as he is a great singer, a nice guy and very enthusiastic. So it will be very interesting to follow…. I got a couple of videos from last night of each of them, one with Stephen doing a Dylan duet with Julia Lins-Gordon, who works behind the bar – and is also a writer – and another of All the Roads doing a Damien Rice song, really well, as usual…. I found myself having fun when an Irish spectator sitting at the bar in front of the stage made a request to me during my set: “Do you know any Christy Moore songs?” Wow! I couldn’t believe that for once I could actually fulfill a request, and this time on a performer who is not obscure, but not mainstream pop, rock, folk either. Or rather, pretty much a mainstream kind of guy in Ireland in the folk area, but a million miles from being a household name elsewhere in the world. He was the singer with the band Planxty, and part of the traditional folk revival of the 60s and 70s. Unfortunately, I was so stunned by the request that it took me a while to find a song I should do, and I missed the most obvious one. I started by trying to do his own beautiful “January Man,” but I forgot the lyrics, which I have barely ever memorized. I then realized that although he did not write the “Raggle Taggle Gypsies,” he certainly sang it with Planxty, and so I did that one, which I have done for years. It was only after I left the pub that I recalled that I should have done “Only Our Rivers Run Free,” which Moore did, although it was written by Mickey McConnell, and I also do it occasionally. At the Galway we were also treated to a performance by Tory Roucaud, who was on a Christmas visit to Paris from her new home of Switzerland, where there are not enough open mics for her in Zurich…. At the Tennessee I was immediately treated to two songs by James Iansiti, the MC, who when I arrived was playing one of his own songs – This Next Song – with his bass player. Then he joined another guitar player singing a song by the Police. There were a lot of interesting bits going on at the Tennessee but the one that probably took my attention more than any was the combination of two people I met separately but who have written some songs together and travelled together and developed into an interesting and cool duo…. This was Zoe Kelly from Australia and Jamie Turner from England. They travelled in Ireland and wrote a song about being stopped on the highway by the police – and they wrote another song together as well. It was nice stuff, and very cool to see how open mic relationships can develop into something. Unfortunately, Zoe is about to return to Australia after many months in Europe….